A couple of months ago, Clarence Eckerson Jr of Streetfilms fame visited Assen and Groningen. He's now finished the wonderful film above and I recommend that you read about it on the streetfilms website. Much has been written about Groningen. It's the world's leading "cycling city" by modal share and has held this position quite consistently for many years. While roughly 60% of journeys in the centre of the city are by bike and about 50% for the city as a whole, cycling doesn't fizzle at the suburbs or at the edge of the city. Roughly 30% of all journeys made in the whole rural and sparsely populated province of Groningen (which shares its name with its own capital) are by bike. A high student population is very often related to a high modal share for cycling, and this holds true in the Netherlands as well as in other countries. Groningers have the lowest average age of any Dutch city due to the high student population who make up 50000 of the city's 190000 population. 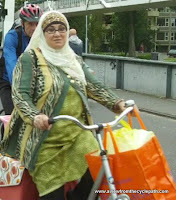 However, people cycle in Groningen far more than can be accounted for only by the size of the student population. Groningen took deliberate action in the 1970s to make the city a better place to live and to grow cycling and there has been a continuous programme of change since that time. While the centre of Groningen is dense, the overall density of the city isn't actually particularly high and many people make longer journeys by bike. There has long been a network of routes which cover the entire countryside and during the period that I commuted to Groningen, I videoed some of the other commuters on a different route. Groningen is now building new high speed cycle routes to aid commuters making longer journeys from villages. Congestion due to students using particular routes by bike resulted in alternative cycling routes being promoted to improve journey times. People complain about the number of bicycles parked, even though they themselves are cyclists. It's almost impossible to keep up with the demand for cycle-parking. The main railway station in Groningen featured in Clarence's video currently has spaces for around 11000 bicycles, up from about 3000 ten years ago. However the cycle-park in not adequate at the weekends so current plans are for the number of spaces to rise to 19000 by 2020. Pedestrians are provided with red carpets outside shops in order to discourage the parking of bicycles in particularly difficult locations. 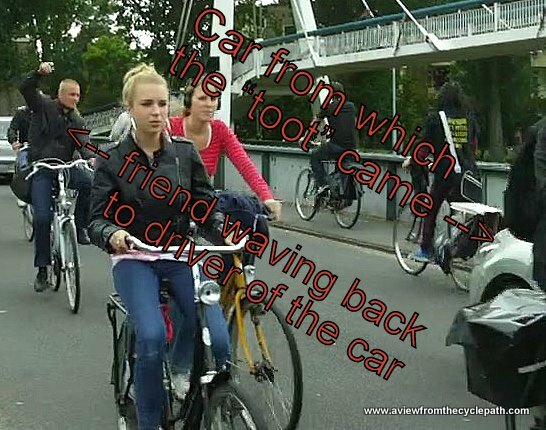 Local laws prohibit parents from driving their children to school in Groningen as this caused a problem for cyclists. This is, of course, greatly to the benefit of children. Note that the main railway station cycle-park featured in the video isn't the only large cycle-park in the city. See also the cycle parking at an award winning smaller railway station in Groningen and the bicycle light vending machine at one of many free guarded cycle-parks in the city. Read more about the triple bridge where cyclists can still cross the canal when a ship requires the bridge to open and about how simple automated counters are used to gather accurate statistics about cyclists. You may also like to see if you can spot some of the same places in the city centre featured in Clarence's film as well as some of my videos and photos in some films shot in the car dominated Groningen of the 1960s. Despite all this, Groningen isn't perfect and local campaigners made sure that the city would lose the "Cycle City 2011" competition in large part because the city contains the most dangerous road junction in the whole country and a bridge "as steep as Alpe d'Huez". I made sure that I showed Clarence some of the problems with the city but they unfortunately didn't make their way into the video. Do you want to see it for yourself ? We're organising study tours again next year. The first open tour will be in April. Please contact us to book a place. Groningen was a leader in redesigning itself as a "cycling city" but all other Dutch cities followed similar policies. To achieve the same success as the Dutch have it is necessary to copy from the best examples and don't do anything just because it's "Dutch". 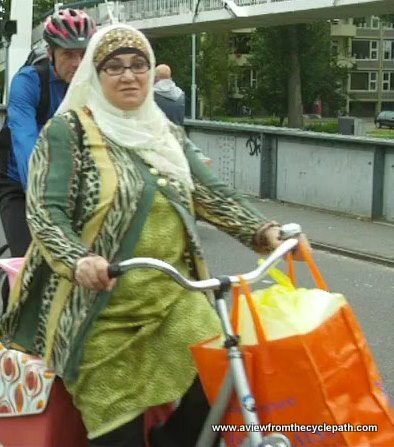 It won't work to just try to pick one aspect of what makes cycling work in the Netherlands. The comprehensive network of routes which allow cycling journeys to be direct and subjectively safe requires everything that has been done here. Note that Zwolle has been snapping at Groningen's heels for many years now and recent figures suggest this smaller Dutch city may actually have surpassed Groningen for the proportion of trips by bike.